After a two week hiatus due to wet and unseasonable conditions, everyone was back for the third night of the racing season this past Saturday, May 24 at Midvale Speedway. Stellar fields of Late Models and Economy Modifieds were on hand for their 50-lap features, with over 20 in each class. The skid plate race in addition to racing in the Street Stocks, Compacts, and Mini Trucks were also on the card. 20 McIntosh Oil Company Late Models took the green flag in the $1,500 to win 50-lap feature. The craziness began on the opening start when outside polesitter Roger Linard, driving the Ron Kirkpatrick #23 got sideways at the finish line and looped it heading into turn one. Linard collected fellow veteran Gary Hoopingarner, who was driving the Ed Mason #11. Both were able to continue. With Linard dropping to the tail after a pitstop, Mike Mazzagatti became the outside front row starter with Matthew Mills to the inside. Mazzagatti raced out front, while Alex Rosenberry and Bryant Smith made their way into second and third quite quickly. Rosenberry followed Mazzagatti for a while before Smith got by. The duo followed the Mazzagatti ride closely during what was a 32-lap green flag run. The Clinton, Ohio driver was doing a pretty good job considering a worsening loose condition while being hounded by Smith and Rosenberry. On lap 33, Smith set Mazzagatti up for a low lane pass by going high into three and dropping across the bottom out of four. Smith pulled alongside but as the duo raced across the stripe contact occured, resulting in Mazzagatti's car backing into the turn one wall. It was deemed by officials that Mazzagatti tried to protect the bottom lane and restarted from the tail. On the next restart, Rosenberry rocketed through one and two in the outside lane to take the lead. However, the lead was short lived as Marcus Malcuit, who had climbed his way from deep in the pack, made contact with Smith, creating another spin. The last bit of drama occurred following the next restart. Smith, whose car was definitely not handling the best at this point of the race, pushed up in turns one and two. Rosenberry drove to the inside in the second turn and looked to be on his way to taking the top spot. However, he lost a bit of momentum coming off of the corner and Smith pulled slightly ahead. Going into three, Rosenberry tried to make another run, but clipped the left rear of the Smith machine. After the few cautions in the middle involving the lead battles, the field went the final 17 laps caution free. Smith dodged the three bullets and eventually had Mike Miller and Bubba Smith in his rear view mirror at the finish. 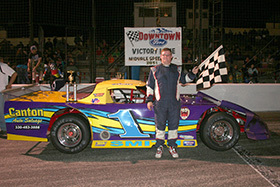 For Smith, it was his second win in the Freedom Auto Finance/Finish Line Designs #1. Following Miller and Bubba Smith were Randy Smart and Rick Sibila. The rest of the top ten were Joe Linard, Tom Stankiewicz, Rosenberry, Bob Schneider, Jr., and Mazzagatti. John Sandquist won the last chance race to transfer, while Bubba Smith set a track record in qualifying. The Summit Racing Economy Modified 50-lapper was much like the Late Models in that the eventual winner came away virtually unscathed after a few mishaps. At the start, Adam Stewart, driving the Joe Ujcich machine, raced into the lead as Tad Grove dropped into second. There were a couple of laps that Grove did lead, edging him at the line in the outside groove, only to fall in line again. On lap 12 of the race, Mike Green moved into the runner up spot, right before a caution. Green tried his hand at taking the lead to no avail before it was Steve Mowery's turn. Mowery had his opportunity go away with a mishap giving second back to Green. Modified veteran, Glen Jewell, moved into second on lap 28 and started to challenge Stewart for the lead. Unfortunately for Jewell, his chances went away after making slight contact with Stewart, creating a spin off of turn two. Tim Westerfield, Jr. was another driver that was shuffling back and forth in second and third challenging for the lead. Westerfield was also involved in a mishap and had to drop to the tail. The race saw some great action with several drivers all having their chance at Stewart. However, in the end, the Canton, Ohio driver did a great job at protecting the inside lane and withstood a couple of spins that resulted in contact to claim the victory. Following Stewart in the H&H Napa/Mr. D's #11 were Justin Courtney, Mike Green, Kevin McClintock, and Tad Grove. Also crossing the stripe in the top ten were Mike Bowers, Shawn Marder, Tim Westerfield, Jr., Don Boron, Jr., and Brandon Bailey. In post race inspection, Green, Grove, and Bowers had their runs disallowed due to various infractions. Chris Piehl won the last chance race, while McClintock set fast time. Vince Martin led early in the J.D. Byrider Street Stock feature. On a lap three restart, Waylon Orr, who continues to get faster and faster, took the top spot away from Martin. On lap eight, top qualifier Rick Elkins, Jr. mounted a challenge after quickly working his way through the field. Elkins took over the top spot while Orr held onto second until the final lap when Mike Martin was able to get by as well as Gary Hoopingarner. At the checkered, it was the Selway Heating & Cooling/Canton Floors #62 of Elkins racing to the impressive victory, while Martin, Hoopingarner, Orr, and Dennis Wood completed the top five. Others in the top ten included Bob Passwaters, Sr., Austin Harvey, Vince Martin, Bob Passwaters, Jr., and Todd Miller. The strong division had heat wins go to Passwaters, Sr. and Orr. The Canton Auto Salvage Compacts put on a great show with three and even four wide racing in their A-Feature. With the field all bunched up and speeds slowed, point leader, Kyle Grove took advantage of the only open spot, the exteme high lane to move forward. Making a number of three wide passes, Grove got to the front quickly, passing Dale Beatty for the top spot after Beatty moved by Daniel Risley moments earlier. Grove cruised to the victory as the field diced for positions behind him. At the checkered, the Wissman Trucking/J.D. Byrider #3 was followed by Kyle Finlayson who had a real strong run, Dan Buckey who has been very consistent this season, and Clayton Oliver and Tim Frederick who garnered solid finishes. The rest of the top ten were Wes Ennis, Beatty, Jeffrey Orr, Colton Cottis, and Larry Ennis, Jr. In the second Compact feature, Zack Cogar and Gerald Hahn were the early race leaders. Gage Jaberg took over on lap seven with Bruce Gibson in hot pursuit. Jaberg, the son of Jim Jaberg, is behind the wheel in his first season of racing. Jaberg has shown signs of success over the first couple of weeks of racing but on night three, he put it all together for his first career win. The Parkway Auto Superstore/Route 39 Auto Salvage #21 was followed by Gibson, Chase Beatty, Allen Clark, and Hahn. The rest of the top ten were Bobby Gainer, Josh Roberts, Cameron Walker, Cristian Bailey, and Ryan Shreffler. Gibson's second place run was disallowed after post race tech. Compact preliminary wins went to Greg Grove, Kyle Finlayson, Bobby Gainer, and Josh Roberts. Cyler Bertram was the early leader in the 10-lap Finish Line Motors Mini Truck feature. Bertram was fending off challenges from Mike Martin, who had won the first two features this season. Bertram's truck, which is a rocket down the straightaway but really loose in the turns, was on the edge lap after lap. Somehow, Bertram was able to hold Martin off until lap number seven when Bertram spun into the infield coming off of turn two. Martin went on to the victory, while Keith Anderson was much improved and finished second. Derek Cordia was third, while Bertram and Bill Aubihl completed the top five. Martin also set fast time and won the heat. The final race of the night was the always exciting skid plate race. 13 competitors took the green from a Formula One start with Brent Shreffler dominating for much of the event. In fact, with just a couple of laps to go, Shreffler had over a half track lead on second place competitor Bubba Smith. Shreffler looked to have it wrapped up before a spin and the inability to get the car righted cost him the win. Smith raced by to take the victory. Following Smith was Shreffler and Duane Smarsh. Coming up this Saturday, May 31, all five divisions will be in action in addition to spectator drags and pursuit races. Pit gates will open at 2:30, hotlaps and grandstands at 3:00, qualifying at 4:45, and racing action at 6:30. Grandstand admission will be $12 for adults, $10 for seniors 62+, $8 for kids 6-1 and children five and under are free. For more info, visit www.midvalespeedway.com.